Home / Reviews / ExpressVPN Review 2016: How good are they? ExpressVPN Review 2016: How good are they? ExpressVPN offer an overall good all round service suitable for many uses. Easy Windows & Mac clients. Android & iOS app support. In this ExpressVPN review 2016 I’ll be taking a look at the VPN service they offer and asking is any good? and if so, how good? ExpressVPN is known to be a good VPN provider but are they a great one and being one of the biggest and well known does that equal a service that is value for money? Over the past few weeks I’ve been putting ExpressVPN through their paces to test their service, speeds, software, reliability and more. So keep on reading to find out if you should sign up to ExpressVPN or not. If you’re pushed for time skip to the bottom for my verdict where I round up the whole review in as few words as possible. Save money on longer subscriptions. ExpressVPN is slightly more expensive than most VPN providers but you do get a little more which does go some way to explain the higher price tag. One standard package is available that contains all the features and like most providers you’re able to sign-up for varying lengths of time based on your need. The monthly package price is a little high for my liking and while they do have more countries available to connect to than most other VPN providers it does make sense to consider their 6 month or 12 month package to save money. At just £5.76 (US$8.32) per month when taking the yearly package, it really does make sense and is cost effective. ExpressVPN has a huge 30-day Money Back Guarantee across all package lengths so if you do sign up for a package that you’re unhappy with then you get a massive 30 days to get your money back. If you’ve looked around at other providers you’ll know that isn’t common elsewhere. PC, Mac, Android and iOS clients. Unlimited downloading & server switching. I last reviewed ExpressVPN in May of 2015 and since then a lot has changed giving you more bang for your buck. ExpressVPN offers VPN connections via OpenVPN both UDP and TCP, PPTP, L2TP/IPSec and SSTP. If you’re unsure what the difference between these is then I recommend using OpenVPN for maximum privacy or check out our guide if you want to learn about the differences. ExpressVPN is suitable to use on all devices as they offer custom software for Windows and Mac computers and they also have apps for Apple iOS and Android devices. The mobile solutions allow you to protect your phone, tablet or other portable devices. You’re free to alternate between the different software and apps that ExpressVPN provide and as part of their terms of service it allows you to use the service at the same time on 1 main device like a desktop computer or laptop and 1 mobile device giving you the ability to secure your home connection as well as your mobile one. The Windows and Mac client essentially have the same layout so if you’ve used one then the other is a simple transition. The desktop client is extremely easy to use. The main window allows you to connect and disconnect at the click of a button. Country selection is handled in a separate window accessed by clicking “Select Another Location”. From here you can sort countries by Recommended, Region and Name making it really quick and easy to find the location you want. If you’re a new user then you don’t really need to concern yourself with anything else and it’s basically just click and go. I found the “Recommended” category really helpful as it lists the major locations for accessing geo-restricted content like BBC iPlayer and Netflix such as the UK and US and also has the kinds of countries you’re likely to want to connect to if you’re concerned about privacy such as Switzerland and the Netherlands. Of course you can find other countries easily too but little touches like this let you get connected to the right server with minimal fuss. If you’re a little more advanced then a settings area allows you to configure other options such as VPN protocol, Kill Switch, and DNS settings etc. As I don’t own an iOS device I instead tested the Android mobile app from ExpressVPN. Upon launching you have the ability to sign up for a free 1-day trial by entering your email address. I found this to be a nice touch if you want to test the service. 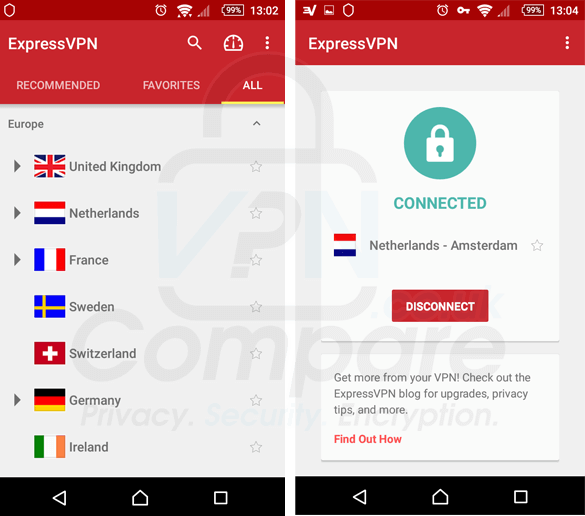 The ExpressVPN Android app has been completely redesigned from my last review back in 2015 and is now much more intuitive and user friendly. The layout is actually similar to the desktop clients which makes transitioning between desktop and mobile an easy task. After login the main screen is split between Recommended, Favourite and All Servers making VPN server selection quick and painless. The settings area allows choosing between a UDP and TCP connection and also an option to launch the app on boot. Apart from that there are very few other settings aside from account related or referring friends etc. One feature I did like was the wealth of help information available including topics like “choosing a protocol” to “what server to select for various tasks” and more. If you’re new to VPN use then the ExpressVPN app is certainly very user friendly and will answer most questions you have. If you want servers and you want servers in a ton of countries then ExpressVPN is the service for you. While ExpressVPN might be a few dollars more per month than most other providers you do get access to a massive 78 different countries and off the top of my head I only know of one other provider that offers more country locations. I reviewed ExpressVPN back in May 2015 and in the 9 months since they haven’t added any more countries to their service but have added server capacity in the existing countries. With ExpressVPN offering so many different country locations it makes the service suitable for a multitude of purposes. If you want to access geo-restricted content from the UK like BBC iPlayer, Sky Go & BT Sport or from the US like Hulu, CBS and more then ExpressVPN have you covered. If you want to change your Netflix region then you have a potential 78 different regions to choose from. If you’re after encrypting your connection and tunnelling out to another country then there are plenty available and if you’re simply after encrypting your connection locally then there is a good chance you’ll find a server in the country you’re in and if not there will be one close by. 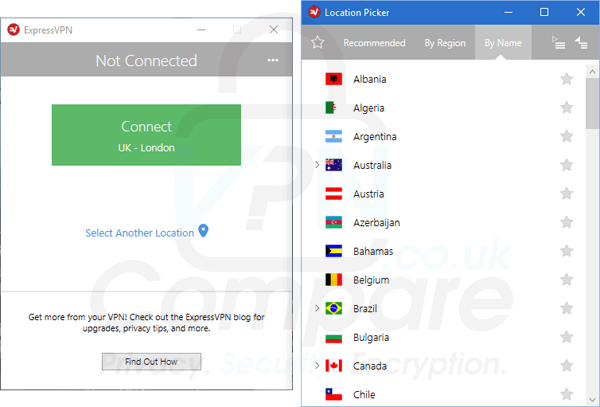 This alone makes ExpressVPN great for those who are travelling and want to keep their wi-fi connection secure. Like many other providers ExpressVPN allow concurrent connection on up to 2 devices. They do specify that one should be a mobile device, however, I imagine this is impossible for them to implement and more for marketing purposes so you’re likely to be good to go on any combination of 2 devices. ExpressVPN offers unlimited bandwidth and unlimited server switching meaning you can download as much as you want and swap servers as many times as you wish. A few other worthwhile observations to point out is the massive 30-day money back guarantee, unlimited speeds and no logging of your browsing activity. ExpressVPN uses Shared IP Addresses meaning the IP address you access from is shared with other users giving a weaved web of activity with other traffic adding up to extra privacy for your session. Icelandic server a little slow. When I look for a VPN service for personal use one of the most critical aspects is Speed. Encryption, security and the policies of the VPN service you’re entrusting your data with are highly important but with that speed is the next most important factor. If you have a highly secure provider with speeds so slow it is unusable then it’s a pointless service. Over the past few weeks I’ve been browsing and doing my daily online activity while connected to ExpressVPN both on my Windows desktop, my laptop and my Android mobile phone and found them to be reliable for everyday use. From streaming videos on YouTube, watching BBC iPlayer in HD, reading emails, browsing websites and more, nothing was an issue and I noticed no slowdowns. As part of our review test procedure I downloaded a 10gb test file while connected to the ExpressVPN service via their custom Windows software on a Windows 10 system. I used the OpenVPN protocol via UDP using 256 bit encryption. All testing was carried out on 17th February, 2016 between 14:00 and 15:00 from the United Kingdom. My connection speed without VPN at the time of testing was 158.80 Mbps. The servers tested in order were as follows. Although ExpressVPN isn’t going to be breaking any speed records what they do have is decent speeds that are reliable. Across 5 out of 6 servers tested the speed was essentially the same which included those at distance like New York, USA. Apart from Iceland that let down the results a little all the other servers were perfectly acceptable and while ExpressVPN isn’t the fastest VPN provider available they do offer decent robust speeds that will be suitable for everyday use and a multitude of purposes. Encryption stronger since last review. ExpressVPN offers four different VPN protocols and while OpenVPN is considered the most secure the others available include PPTP, L2TP and SSTP should you need to make use of them. ExpressVPN makes use of 256-bit encryption when using the OpenVPN protocol. The cipher used is AES-256-CBC. This is a massive improvement since my last review. I’m pleased to report that ExpressVPN has also increased their RSA Key for handshaking from 1024 bit back in May 2015 to a 2048 bit RSA key. This is great news and I’m very pleased to see this improvement. ExpressVPN is under the jurisdiction of the British Virgin Islands for legal purposes so if you want to make sure you’re outside a five eyes country for privacy reasons then ExpressVPN would make a good choice. ExpressVPN is one of few providers that offer live chat support 24 hours per day, 7 days per week, 365 days per year. If you need a query answering swiftly then this method of communication is ideal. It is also possible to use their contact form to open a ticket or email them directly if you’re in no hurry for a response. ExpressVPN is one of the most popular VPN providers worldwide and when reviewing their service I can see why. When I reviewed ExpressVPN back in the middle of 2015 they offered a good service but were let down on lower end encryption and speeds that had room for improvement. I’m pleased to report that in the 9 months that have passed since my last review that both the encryption and speeds have been greatly improved. Encryption is now inline with most other providers giving you a secure and private VPN experience ensuring your connection is safe from unscrupulous snoopers. Speeds have quadrupled since my last test meaning everything from streaming video from abroad in high quality to downloading and everyday browsing are a pleasure over the ExpressVPN network. ExpressVPN is a few dollars more expensive than most other providers but the massive range of 78 countries you have to connect to makes up for this slightly higher price tag. Software and apps for Windows, Mac, iOS and Android make the service available to most and with 2 concurrent connections allowed you can protect both your desktop and mobile device. I’m really pleased with the improvements ExpressVPN have made and whether you’re a beginner or expert there is something on offer for all. A good VPN service has got even better and if you can ignore the few dollar higher price tag then they will make a great choice as a VPN service. VyprVPN Review 2019: Are they the Top VPN?